You’ll remember earlier this year Iceage visited New York to play two shows and help present the ‘Thrown Together‘ gallery event, an art exhibition featuring some artworks from their friends local and global. Los Angeles-based artist/photographer/director/label boss Cali Thornhill Dewitt came along for the ride and produced a striking short film tracking the band’s activities that weekend in the city & shots of the visuals on display, set to live audio of “Morals” from ‘You’re Nothing‘ — you can watch this below or at Pitchfork.TV today. 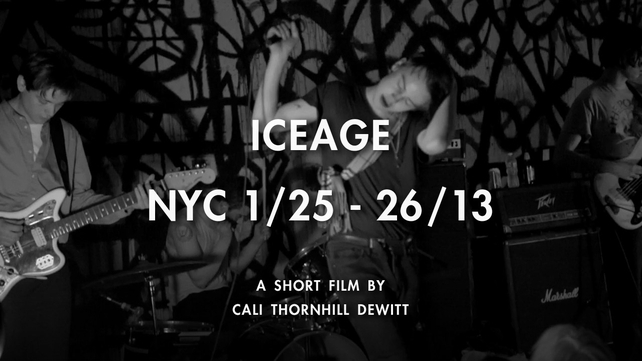 Iceage are on tour right now and will be in the states at the end of the month. Pick up ‘You’re Nothing‘ at the Matador store or your favorite music retailler.